Click the pic for a closer look. 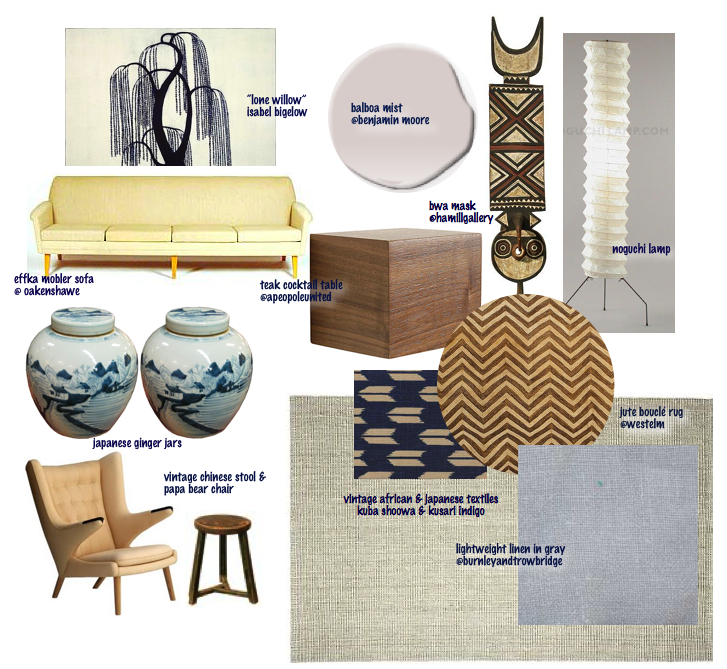 Another cork board with possible plans for the living room… I’ve loved DC designer Darryl Carter’s work since seeing a spread of his home back in 1997 in Metropolitan Home. His work and his book The New Traditional inspired this version of the room. I’ve taken the approach of using classic mid-century pieces to ground the room–the Georgian-shaped sofa, the Wegner wing chair, the vintage Chinese stool and the Noguchi lamp. The palette this time around feels a bit more classical because I’ve added a jute rug and linen fabric that pick up the same pebble-grey in the wall paint. These photos are the inspiration for the room. The wall behind our sofa is exposed brick as well. The wool rug has a very similar feel to the jute rug I’ve chosen from West Elm. The color palette is drawn from the materials in the furnishings and includes a mix of wood tones, weathered grays, and washed-looking natural linen.